Resistors are the most fundamental and commonly used component in all the electronic circuits. The main function of a resistor within an electrical or electronic circuit is to oppose or resist the flow of current, hence named as resistor . The symbol of resistor is shown in fig. below. Resistance is measured in units called “Ohm”. Resistors can be broadly of two types. A fixed resistor is one for which the value of its resistance is specified or fixed and cannot be varied in general. Carbon Film Resistors : These are made of carbon dust or graphite paste and have low wattage values. Metal Film Resistors : These are made from conductive metal oxide paste and have very low wattage values. Wire wound resistors : These resistors have metallic bodies for heat sink mounting and have very high wattage ratings. This is the most general purpose, cheap resistor used in electrical and electronic circuits. Their resistive element is manufactured from a mixture of finely ground carbon dust or graphite (similar to pencil lead) and a non-conducting ceramic (clay) powder to bind it all together. The ratio of carbon dust to ceramic i.e. conductor to insulator, determines the overall resistive value and the higher the ratio of carbon, the lower the overall resistance. The mixture is then moulded into a cylindrical shape with metal wires or leads attached to each end to provide the electrical connection. Then finally it is coated with an outer insulating material and colour coded markings to denote its resistive value. Usually the tolerance of the resistance value is ±5%.Such resistors with power ratings of 1/8W, 1/4W and 1/2W are frequently used. The disadvantage of using carbon film resistors is that they tend to be electrically noisy. Metal film resistors are used when a higher tolerance (more accurate value) is needed. Nichrome (Ni-Cr) is generally used for the material of resistor. They are much more accurate in value than carbon film resistors. They have about ±0.05% tolerance. A wire wound resistor is made of metal resistance wire, and because of this, they can be manufactured to precise values. Also, high-wattage resistors can be made by using a thick wire material. Wire wound resistors cannot be used for high frequency circuits. Another type of resistor is the Ceramic resistor. These are wire wound resistors in a ceramic case, strengthened with a special cement. They have very high power ratings, from 1 or 2 watts to dozens of watts. These resistors can become extremely hot when used for high power applications, and this must be taken into account when designing the circuit. 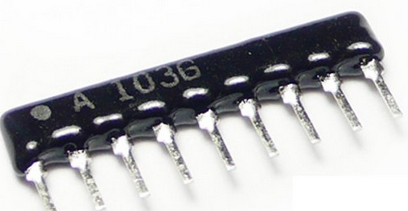 It is made with many resistors of the same value, all in one package. One side of each resistor is connected with one side of all the other resistors inside. One example of its use is to control the current in a circuit powering many light emitting diodes (LEDs). In the fig. below, 8 resistors are housed in the package. Each of the leads on the package is one resistor. The ninth lead on the left side is the common lead. The 4S indicates that the package contains 4 independent resistors that are not wired together inside. The housing has eight leads instead of nine. There are two general ways in which variable resistors are used. One is the variable resistor whose value is easily changed. The other is semi-fixed resistor that is not meant to be adjusted by anyone but a technician. It is used to adjust the operating condition of the circuit by the technician. Semi-fixed resistors are used to compensate for the inaccuracies of the resistors, and to fine-tune a circuit. The rotation angle of the variable resistor is usually about 300 degrees. 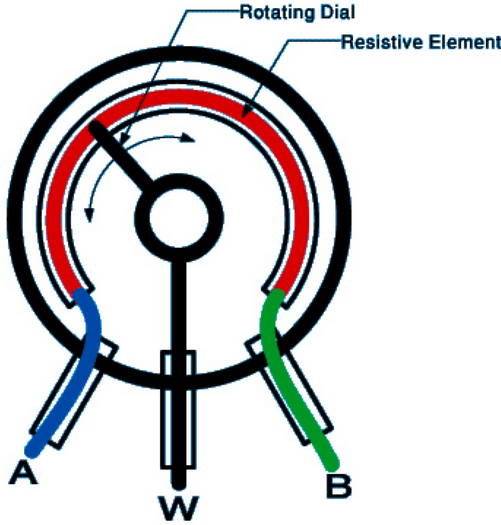 Some variable resistors must be turned many times( multi-turn Pot) to use the whole range of resistance they offer. This allows for very precise adjustments of their value.These are called “Potentiometers” or “Trimmer Potentiometers” or “presets”. There are three ways in which a variable resistor’s value can change according to the rotation angle of its axis. When type “A” rotates clockwise, at first, the resistance value changes slowly and then in the second half of its axis, it changes very quickly. It is well suited to adjust a low sound subtly. They are sometimes called “audio taper” potentiometers. In type “B” the rotation of the axis and the change of the resistance value are directly related. The rate of change is the same, or linear, throughout the sweep of the axis. This type suits a resistance value adjustment in a circuit, a balance circuit and so on. They are sometimes called “linear taper” potentiometers. Type “C” changes exactly the opposite way to type “A”. In the early stages of the rotation of the axis, the resistance value changes rapidly, and in the second half, the change occurs more slowly. As for the variable resistor, most are type “A” or type “B”.